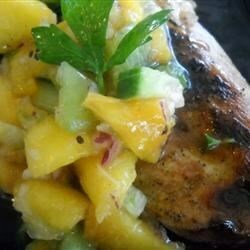 "A great, fruity accompaniment for chicken breasts. Viva la salsa!" In a large nonporous glass bowl combine the kiwi, peaches/nectarines/apricots, jalapeno chile pepper, cucumber, onion, lemon juice, salt and pepper. Mix all together. Cover bowl and refrigerate overnight. See how to make a quick, saucy shredded chicken filling for burritos and tacos. This was good, I added fresh parsley and left out the kiwi, and used leeks because that's what I had on hand.